Weather: sunny and cold, high of minus 5, low of minus 13. Skaters came out but it never got crowded, too chilly. Ice maintenance: 9am s/f. 12pm s/f. 4.55 s/f. 8pm s/f. Weather: sunny and even colder than yesterday: high of -11, low of -18. Ice maintenance:9am s/f both, 1pm s/f both 3.15pm s/f only hockey side, pleasure not used, 7.20pm s/f both - 9pm s/f of hockey only, pleasure barely used. Weather: sunny and starting out cold (minus 14) but going to warmer -- only -5 this evening. Much gentler than yesterday. And many more people at the rink. 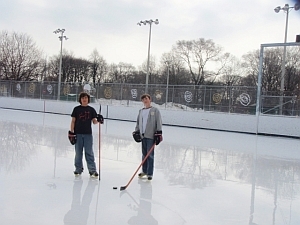 Ice maintenance: 9, 12, 3:30, 7:30, all s&f both sides, 8:55 s/f hockey side only (said the blade was impossibly dull). [[ Weather: started out at minus 9 this morning, sunny all day, and up to 1 by mid-afternoon. Low -6. Ice maintenance: 9am s/f both, 12:30 s/f both, 3:45 s/f both, Rink closed from 3.30 - 5:30 hockey side, till 6pm pleasure-skating side. Pleasure-skating side was cut up more in middle than hockey. Sides of hockey crunchy and badly skated-on 3 ft. from boards north side. On the pleasure-skating side only 2 ft. from boards. Hockey middle solid and in good shape. Recommended that tomorrow we evaluate at 2pm to close the rink. 7pm zamboni blade askew. Maintenance was skipped. (Flooding only would not have been a good idea.) 9pm-9:20 hockey side maint. edges scraped.... blade still not good... light flood. Edges very crunchy. Weather: high of 4, then supposed to go up to 7 overnight. Sunny off and on all morning, which made the ice get puddly and cratered in places. Cloudy with a minute or so of rain around 9.30 pm. The rink was closed after 1 pm. The pleasure-skating side was reopened after 6, but the little kids were allowed to play hockey on it, because they and their dads came out in droves (same last night). The hockey pad was reopened after 7, and then there was a good game until the permit came, and a good game for the permit too. But they said the ice was kind of rough in places and the puck bounced a lot. Ice maintenance: 9am s/f both. 9.55am machine serviced (blade was repaired). 12pm s/f both sides = hot water flood might have ruined the ice. 1.30 closed. 3.30 pm ice slushy. 5:15 pleasure side opened for hockey and pleasure. 7pm hockey scrape, pleasure s/f. 9pm hockey pleasure s/f. Weather: high of 16. Mostly cloudy but with some sunny intervals. The morning sun helped, by covering the rink with a layer of melt-water. If there's water on the ice (from melting, not from a hot flood), that layer of freezing water protects the ice underneath. Water only forms this protective melt-layer if it's very warm out. If it's cold and sunny in March, no water melts and the ice goes straight to slush. But today was an amazing congruence of warmth and melting and then lots of cloudy periods so that the ice didn't get too much sun. That meant kids could skate around the edges by 5 pm, and by 7.30 the ice was just fine. By then the City had made the call to close the rinks, so there was no zamboni to clear off the water. Three kids pushed the water off with giant squeegees, and they were rewarded with as much food as they wanted at the zamboni cafe after. They really stuffed themselves, too, but the ice was perfect when they finished. Sadly, the permit cancelled anyway. But some shinny hockey kids and a few families skated. No ice maintenance at all today.